The Rockport Film Review: "Ida" The Best Foreign Film of 2014! "Ida" is the new film from famed Polish director Pawel Pawlikowski and is one of the best films of the year. It's beautifully shot in black and white and presented in a square format that gives it that extra level of style and authenticity. It's the story of a young girl at a crossroads in her life when the truth about her origins is revealed. Taking place in Poland in the 1960s we are introduced to Anna a young woman who has lived most of her life in a convent and is close to taking her vows to become a nun. Before this will happen the Mother Superior requests that she spend some time with her only living relative, her Aunt Wanda. Wanda has never shown any interest in her previously and Anna is reluctant to leave the safety of the convent. When it comes to the outside world Anna is quite naive but strong-willed. Wanda, however, is quite the opposite, a down on her luck former prosecutor who smokes, drinks, and sleeps around. Upon their first meeting, Anna is given some life-changing information. She is actually Jewish and her birth name is Ida Lebenstein. Her parents put her in the convent as a baby to escape the Nazi's. She is then told they were both killed in the war. Unable to accept her explanation Anna sets out to find the truth about there deaths. Feeling guilty and having nothing else better going on in her life Wanda helps her in her search. They find the farm where her parents were staying during that time and the current residents brush them off. Along the way, Anna crosses paths with a young attractive saxophone player who shows a genuine interest in her. Anna is forced to confront new feelings and choices that she has been protected from her whole life. The choice to be brought up in a convent was never hers and with the revelation that she's Jewish brings up some tough choices. Does she go against everything she has ever known and reinvent her life? Does she return to the convent and continue to live as if nothing has changed? Wanda doesn't force her in one direction or another, but she does seem happy to have her in her life. The women make progress in discovering the fate of Anna's parents and a deal is made with the family at the farm to learn the truth. Now fully knowing what happen Anna is forced to make her choice, which leads to Wanda making one of her own. The character of Anna/Ida is played by first-time actress Agata Trzebuchowska (don't ask me to pronounce it) and she does a fantastic job in translating her inner conflict and repressed emotions in the subtlest of words and gestures. Although I didn't agree with her final decision it was hers and hers alone. 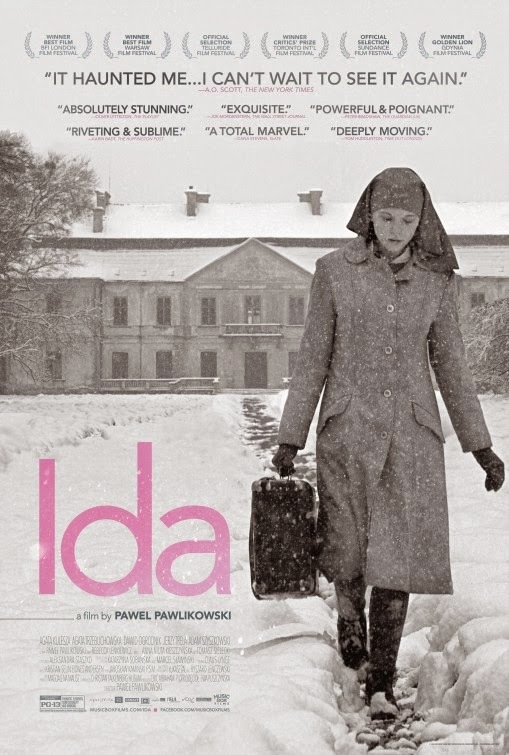 "Ida" is currently available on Netflix instant streaming.